Metal halide (MH) lamp provides high efficiency, long service life and excellent colour rendition. It consists of an arc tube enclosed in a glass chamber made up of borosilicate glass. Arc tube is also called as discharge tube or “burner”. The arc tube consists of argon gas, mercury and metal salts such as sodium iodide. They operate at higher temperatures and pressures. Ballast is used to supply a high starting voltage. The ballast also regulates the lamp starting current and lamp operating current. When a high voltage is supplied to the electrodes arc tube is ionised. As pressure and temperature increase, the materials within the arc tube vaporise and emit light and ultraviolet (UV) radiation. When the UV rays fall over the phosphor coating on the glass chamber visible light is produced. Borosilicate glass reduces the amount of UV radiation that the lamp emits. 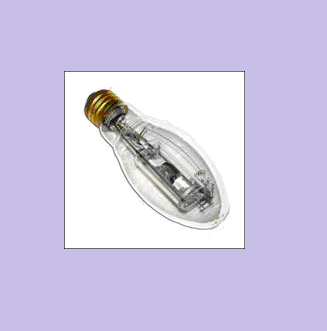 Metal halide (MH) lamps are commonly used in stadiums, warehouses, and industrial. It is also used for the bright blue-tinted car headlights and for aquarium lighting. Low-wattage MH lamps are used in department stores, grocery stores, and many other applications where light quality is important.